According to the new rule of the Zee value pack channel list, Zee Value Family Pack 45 - Now cable and DTH oparators can no longer provide packages to consumers. Now the company has to take money from the consumers who want to see the channels. Following the same rule, Zee has released the charms of channels, which will tell you further about this same Zee value pack channel list called Zee Family Pack. You can also see it, or read it. Star Value Pack 49 Channel List Full Details and Tata Sky 139 Pack Channel List Validity & Activation. All DTH and Cable users you have come to know till now that the Telecom Regulatory Authority of India has issued new rules, and according to the new rules, Cable and DTH oparators can not impose packages on their customers. We will ask the customers to select channels according to their choice. After December 29, 2018 there will be a single rule for DTH, IPTV and Cable oparators. After December 29, the base pack will be 130 paise and there will be no package. Free to Air channels and some good paid channels will be shown in 130 rupees. Apart from this, you have to pay a separate price for premium channels like Zee TV, Star Plus and Colors TV. Following the new rules of the Trai, channels companies have started issuing the list of channels and issuing lists. With all the companies Zee Entertainment has released its Zee value pack channel list (Zee Family Pack). Today I am going to share with you the same Zee Family Pack 45 Channel List. Zee Entertainment Group has created two BOUQUETs for SD chanels with different prices for different languages, including HINDI, ENGLISH, MARATHI, BENGALI, ODIA, TAMIL, TELUGU, KANNADA, ALL SOUTH, ODIA-TELUGU, MARATHI- KANNADA, TAMIL-TELUGU, TAMIL-KANNADA, TELUGU-KANNADA has created such a language group of channels. 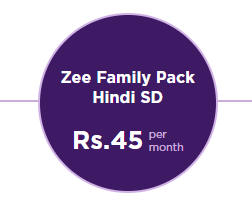 Out of the groups of these languages, Zee Value Pack 45 or Zee Family Pack 45 is worth 45 rupees in Hindi language, BOUQUET. It will be applicable for all Zee Value Pack 45 or Zee Family Pack 45 Dish TV, Videocon D2H, Sun TV, Independent TV, GTPL, Den Network, Airtel Tv, Tata Sky, etc. SD Hindi package is available for the price of 45 Rupees. Package of HD channels is worth 60 rupees. So let's check the value list of value pack of 45 rupees. 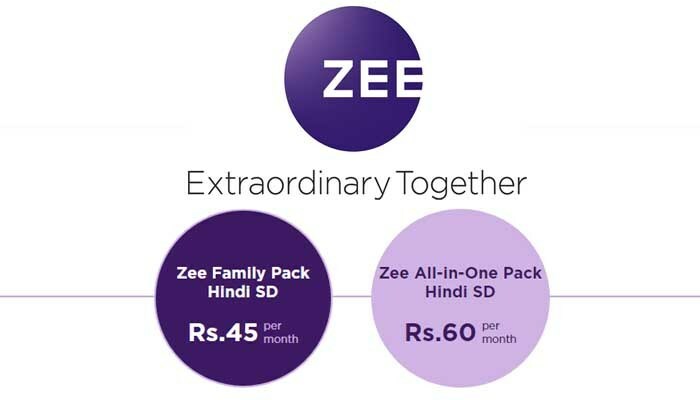 Total 24 channels are available in Zee Value Pack 45 / Zee Family Pack 45. These standard definition channels are found. Hopefully you have got the answer to your question from the information shared with Zee Value Pack 45 / Zee Family Pack 45. Zee value pack channel list, TRAI New rule – 100 Channels in 130 Rs, How to Active Zee Value Pack, Zee Value Pack 45 Channel List / Zee Family Pack 45 Channel List, Zee Entertainment Group Value Pack, Zee Value Pack 45 / Zee Family Pack 45.